Defender Mohamed Fofana has told BBC Sport "I've not closed my international chapter with Mali" despite being overlooked for more than three years. The 30-year-old France-born player's last cap came in January 2012. 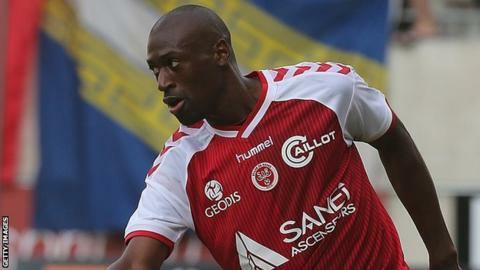 "If I continue to do well with my club Reims I know I will get another opportunity," he said. "Everyone knows how dedicated and passionate I have been for my country over the years so I would love to continue to play for the Eagles." A return to the Mali squad would go some way to ease Fofana's painful memories of his last involvement, when he suffered a thigh injury during a friendly four days before the start of the 2012 Africa Cup of Nations and was ruled out the tournament. Since then he has been unable to force his way back into the set-up and was ignored by former Mali coach Henry Kasperczak. However, Fofana insisted he "holds no grudges against the former coach" and is only interested in looking forward. "I'm not disappointed, it's all part of football," he said. "I'm in the prime of my career now and I want to kick on again, so I can only hope and wait." Fofana admits he is feeling more optimistic about his chances following the appointment of Alain Giresse for a second spell as Mali boss - the former France midfielder gave Fofana his international debut in 2011. And he would relish the chance to be part of the 65-year-old's plans for the 2017 Nations Cup qualifiers, which start in June. "His return gives me hope but once again my club performance will be the yardstick for selection," Fofana said. "I'm not going to give up hope. I don't want to accept it that younger players could keep me out. "I followed Mali's performance at the last Nations Cup and I think they had a relatively successful campaign and I hope to re-join the group as soon as possible."